Detail of what I was wearing today; one of my boyfriend's shirt as a dress and an old black metal necklace from River Island underneath the collar. I love your blog! This necklace is awesome. Did you make it by yourself or just bought? Ahh! I love it!! I was actually thinking about what I'll be wearing tomorrow, and the BF Shirt Popped up in my mind!! Haha! what a cool detail! wow, that'sjust great, i love that idea! The spiked necklace looks totally rad under your bf’s shirt! Which brand is it? And which Color? I absolutely love necklaces like these paired with a shirt! Stunning! Love how the lipstick matches the colour of your hair. Beautiful necklace! looks stand out under the collar! Is that and ear cuff on your ear or a regular earring for pierced ears? Can you suggets me some ear cuff retailers? Like! Ik heb volgens mij een armbandje met die spikes eraan, alleen helemaal verkleurd uiteraard. You are so so so so beautiful!!! You have a beautiful face! ik vind je echt knap! you would lovee this necklace!!! necklace and your hair!! love it! En ik vind je haar zo mooi! Normaal houd ik niet zo van die kleuren in het haar maar jou staat het echt geweldig! I love it. Things like this really suit you! Amazing necklace, and lip colour! This picture belongs in the cover of a magazine like RUSSH. You are so stunningly beautiful with your skin and hair. 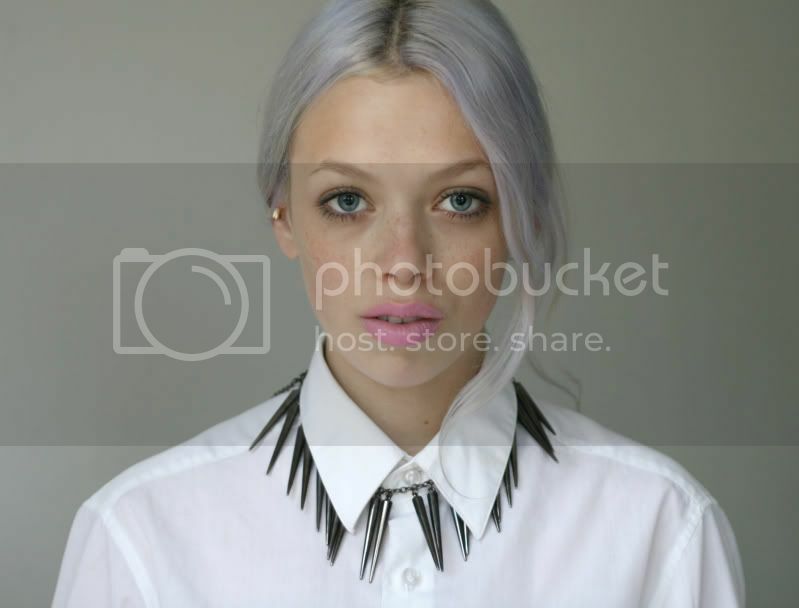 The simplicity of the white shirt contrasted with the sharp necklace is just unbelievable. I need to learn to mix and match more! and that's why you're so perfect! Where did you find that gorgeous earcuff?? I can only find them in silver! I know I've said this before but I can't imagine you'd get tired of hearing it so I'll say it again. This has go to be my favorite personal style blog. period. I'm looking for a shirt like that! Nice necklace especially worn like that! LOVE THIS COLOURS MIX - YOUR HAIR AND YOUR LIPSTICK!!!!!! omg your hair color is adorable! u re so pretty !!! Zo simpel, maar zo stijlvol! your hair is AMAZING!!! i love everything about your style.